As a relatively recent transplant to Toronto from my most recent country of residence, Qatar, I’ve faced many challenges and overcome many hurdles in finding a job and making a true home for myself. Most of the time, it has involved assimilation, but here at TribalScale, I’ve found acceptance. The uniqueness of this experience makes it something worth sharing. I moved to Toronto from Qatar in September 2012, but even before, I spent most of my life jumping from country to country. As an easily adaptable person, I’ve often blended in seamlessly by taking on the cultural narrative du jour. While being easily adaptable has worked strongly in my favour, it has also meant that I’ve often felt at odds with my sense of self and my identity. And nowhere is your sense of self tied to more strongly than to your name. It’s the first thing people know about you — often before they even see you — and it immediately forms someone’s first impression of you, casts assumptions, generalizations, and stereotypes about you. My name is Samiha, meaning forgiveness, a name that is lovely in meaning but one that ultimately stamps me as an outsider. As a newcomer and job hunter, my name, combined with my recent immigration status, might lead a recruiter to assume a few things about me: maybe I wouldn’t “get” Canada’s corporate culture or local best practices, maybe I wouldn’t fit in. After all, each of us has our conscious, and often subconscious, biases. Even if I look and sound like your average Torontonian on the street, on paper, I looked like I was “fresh off the boat.” I’m often greeted with the surprised refrain of “but you don’t have an accent!” which simultaneously reinforces my lack of belonging while congratulating me for fitting in so well. TribalScale was different. On my first day, I introduced myself as Sam and several times I was asked what “Sam” was short for. For the first time in my professional Canadian career, people showed sincere interest in knowing and using my real name. The difference between TribalScale’s culture and that of other companies I’ve joined is a real openness and acceptance of people from different backgrounds and with different experiences. Rather than an impetus to assimilation, I felt that I was able to maintain my own culture within the TribalScale environment. This sense of inclusion is something I’ve found to be pretty unique to the technology sector as a whole. The tech and startup ecosystem is doing a lot to level the playing field for minority groups as it’s often more flexible than traditional industries, or those with entrenched systems and country-specific accreditations. Be Aware of Inherent Biases: HR has conversations with hiring managers throughout the recruitment process. This helps them acknowledge their own biases and understand where they come from. Once there is awareness, it’s much easier to rectify those assumptions and biases. Utilize Blind Interviews: When possible, interview people on the merit of who they are at that exact point in time. Remove their name, education, gender, address, and any other demographic characteristics that might trigger an inherent biases. Run Simulated, Case-Based Interviews: Determine the best-fit for the role based on the quality of their work through hands-on exercises. Put a stress on their performance, not the credentials and experiences listed on their resume. Again, this is about assessing a candidate in real-time, not what’s on paper. Rewrite Job Descriptions: Remove any biased and gendered language from job postings. Such language includes: “hunter,” “ninja,” “gentle,” “warm,” “polished,” “rockstar,” etc… Scrap these sorts of words and replace them with more gender neutral titles like project manager, engineer, or developer. Let the job describe itself. Reinforce Value, Merit, and Cultural Fit: Focus on finding the people that embody and believe in what the company does. When a new hire feels comfortable and included, they will be set up for success, regardless of their background and experience. The truth is, if companies continue to hire and promote people who look, sound, and think like them, then they will never have a greater understanding of all the experiences and perspectives that are different from their own. I’m happy to have a found a place where I can be part of the culture without having to pretend to be something I’m not. As this company continues to reach for the stars, it’s essential that we hold on to that openness tightly so that it remains a core value of our team. 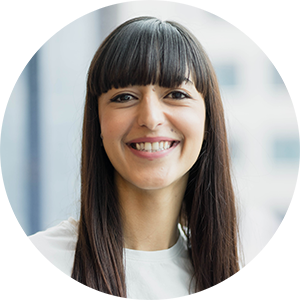 Samiha Kamel leads marketing partnerships at TribalScale, where she collaborates with our partners in all industries for strategic team growth. She is currently focused on TribalScale’s international expansion, building our networks to bring the famous TakeOver Innovation Conference worldwide.